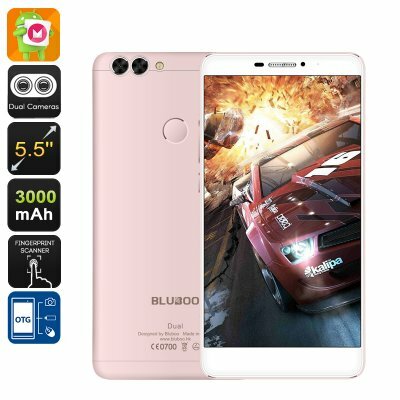 Successfully Added Bluboo Dual Smartphone - Dual Camera, Android 6.0, Quad-Core CPU, 5.5-Inch FHD, 4G, 3000mAh (Rose Gold) to your Shopping Cart. As one of China’s latest Android phones, the Bluboo Dual introduces you to the future of mobile photography. With its ground-breaking dual cameras, this magnificent smartphone does not pack one but two rear cameras. Having two lenses at your disposal allows you to shoot images in amazing detail and stunning clarity – letting you take photographs like never before. Offering an abundance of photography features and customization options, the camera of this Chinese smartphone is perfect for recreational use and professional photographers alike. From now on not a single moment in life passes by uncaptured as, with this Android smartphone at hand, you have all the means necessary to snap absolutely breathtaking pictures at any time of the day. Crafted out of style full aluminum and featuring an ultra-thin design, this flagship smartphone truly is a feast to the eye. With its beautiful 5.5-Inch Full-HD display you’ll be able to enjoy all your media to the absolute most. Watch a FHD movie, play games, or simply enjoy the latest mobile applications – this Android phone is guaranteed to offer a vivid visual experience. Additionally, this state of the art display also features the latest TP technology that allows you to use your smartphone with wet hands and while wearing gloves – significantly increasing your overall user experience. A powerful Quad-Core CPU that has been clocked at 1.5GHz provides a powerful performance. Along with its 2GB RAM, you will be able to play the most demanding of games, watch FHD movies, and engage in excessive multitasking sessions without ever needing to worry about slowing down your device. Its 3000mAh battery lets you enjoy all your phone has to offer for 5 hours continuously, enough to get you through the most intensive of days. Providing you with the option to add in an additional 256GB of external storage, you can be assured that with the Bluboo Dual there will always be some space left to store your newly downloaded games and media – ensuring that from now on you’ll be able to carry along hours worth of mobile entertainment wherever you go. Running on an Android 6.0 operating system, this 5-Inch smartphone provides you with a platform on which to enjoy all the latest features the smartphone industry has to offer. Additionally, this Chinese smartphone supports 4G connectivity - letting you enjoy the fastest data speeds so that you can browse the web, stream movies, and download files in the blink of an eye. No matter where your upcoming trip or adventure will take you, with this magnificent smartphone at hand you’ll always be able to stay connected to your friends and family back home. The Bluboo Dual comes with a 12 months warranty, brought to you by the leader in Chinese smartphones as well as wholesale electronic gadgets..